Fort Jefferson from inside the brick walls. 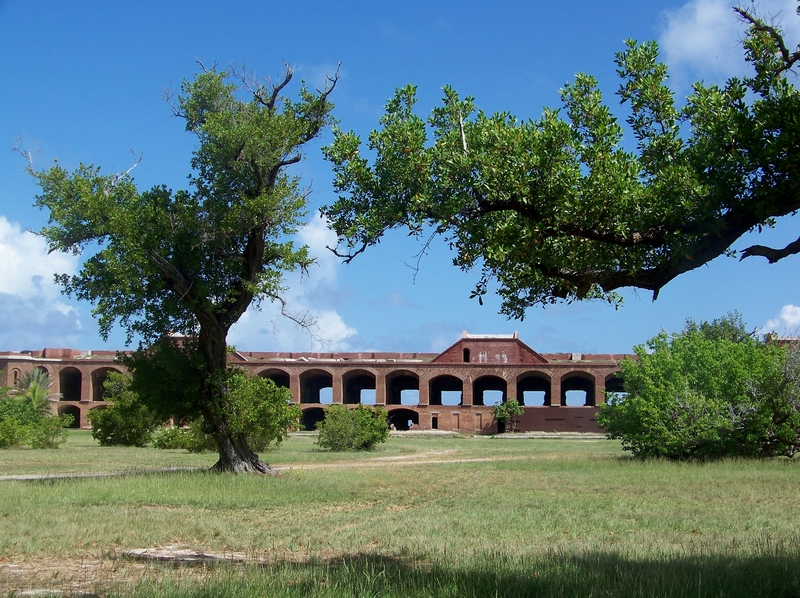 Not so long ago, an article showed up on my Facebook news feed concerning the challenges of the National Park Service as it looks into the future of Fort Jefferson located at the Dry Tortugas. Reading the article, I was reminded of one of the most memorable trips we have ever made to a national park. In 2009 Jim and I, along with my sister and her husband, traveled to Fort Jefferson and Dry Tortugas Natiional Park. What a jewel…how beautiful this place truly is! To reach the Dry Tortugas we boarded a ferry in Key West, FL for the seventy mile trip out to the park. The scenery was astonishing, the color of the water those brilliant shades of aquamarine you have always believed were artificially enhanced when seen on photographs. Looking into the water you realize it really is that deep, rich color, it really is that beautiful! The water is so clear you can see schools of fish almost as clearly as if you were in the water with them. You also see dolphins, pelicans and other birds. It is a marvelous trip! The Gulf of Mexico seen from the ferry to the Dry Tortugas. Fort Jefferson is situated on Garden Key, one of the seven keys which make up Dry Tortugas National Park. It is the largest all-masonry fort in the United States, so large that the entire playing field of Yankee Stadium would fit within its walls. Construction on this massive fort was begun in 1846 for the purpose of helping to control shipping that entered the Gulf of Mexico from the Atlantic Ocean. It was, however, never finished due to problems with settling of the heavy structure. 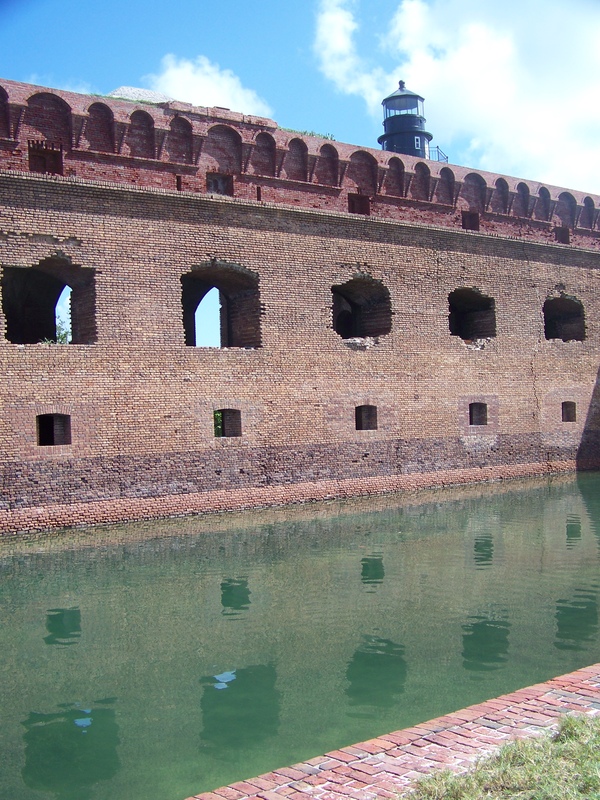 The weather has always been a problem at Fort Jefferson, and the structure has been in almost constant need of repair. 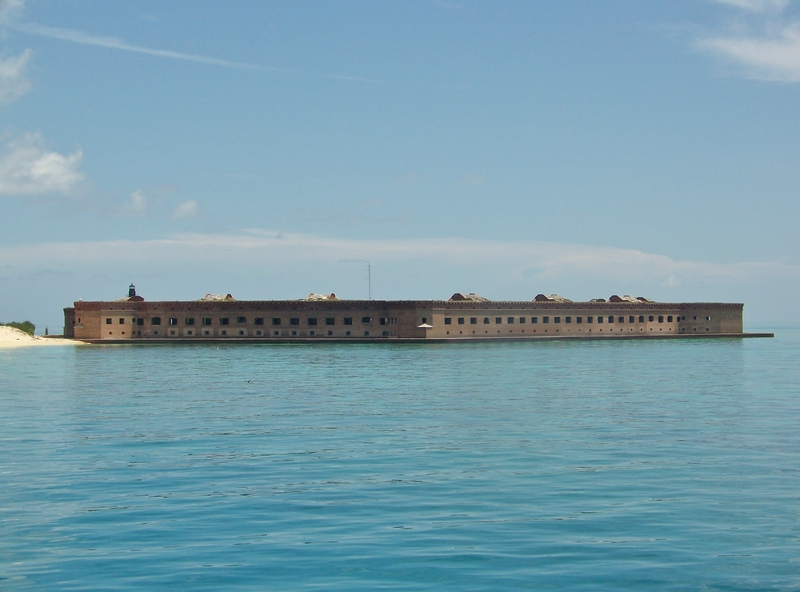 In addition to helping the United States control its interests in the shipping that entered the Gulf of Mexico, Fort Jefferson also served for a time as a military prison. 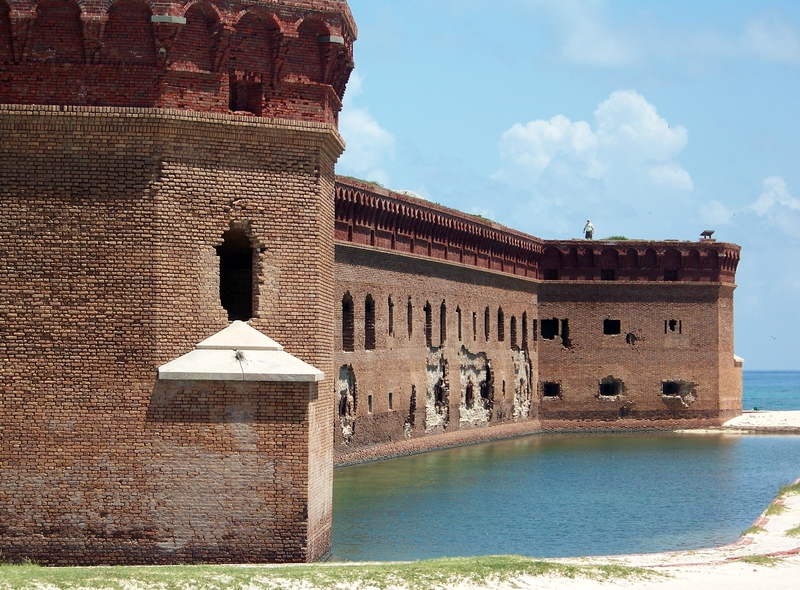 While Florida became the third state to secede from the Union, Fort Jefferson remained under the control of the United States. Perhaps its most famous prisoner was Dr. Samuel Mudd, convicted for aiding and conspiring with John Wilkes Booth in the assassination of President Abraham Lincoln. Fort Jefferson has 2,000 arches and they are one of its most beautiful features. Its most imposing feature as you approach is the lighthouse that was erected in 1825 to warn ships entering the Gulf from the Atlantic Ocean of the dangerous coral reefs in the area. As you near the fort you will notice Loggerhead Key where a new, more powerful, lighthouse was built in 1858. The lighthouse on Loggerhead is still operational today and is under the authority of the US Coast Guard. Garden Key Lighthouse was built in 1825. 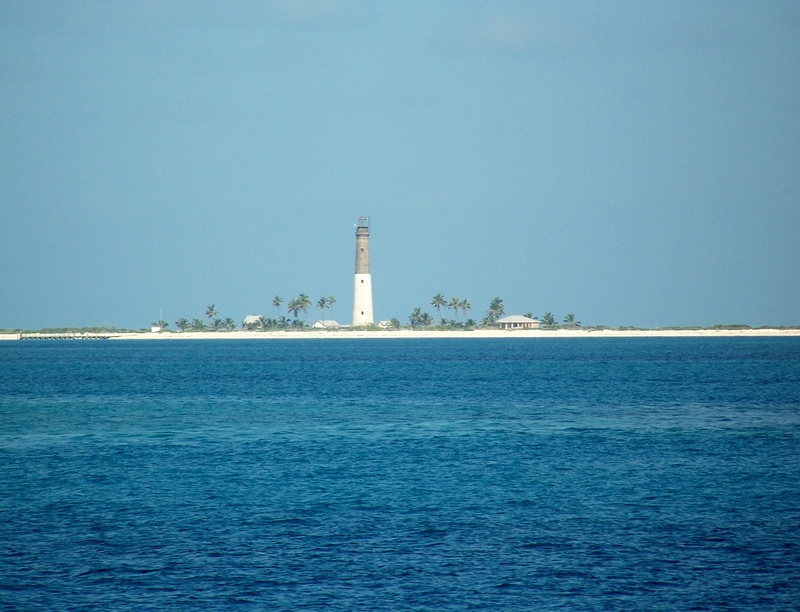 The lighthouse at Loggerhead Key was built in 1858. Loggerhead Key is protected as a nesting site for Loggerhead turtles, who return to the Key each year to lay their eggs. 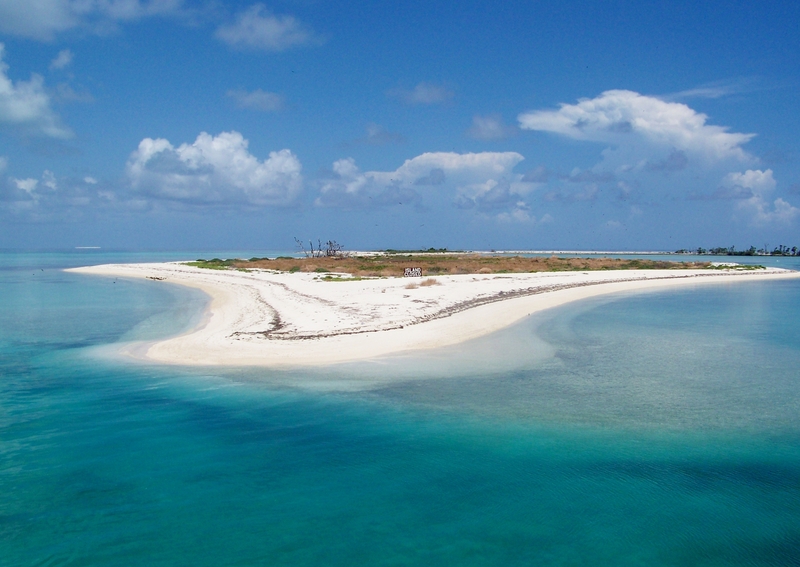 Other keys in the Dry Tortugas are closed for parts of the year to allow for the nesting of various birds. 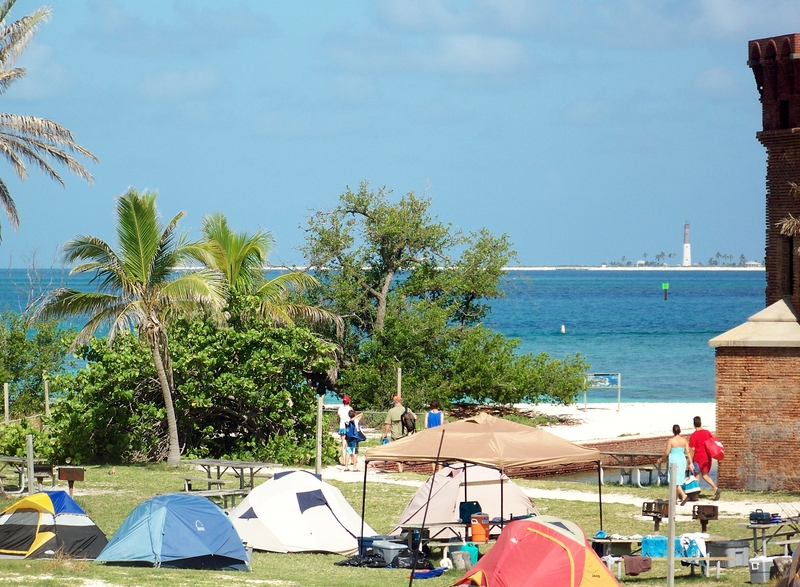 In addition to enjoying the ferry ride and visiting the fort, visitors to Dry Tortugas National Park can camp overnight on the grounds, do some snorkeling(as I did, my first time ever! ), fish or do some birdwatching. 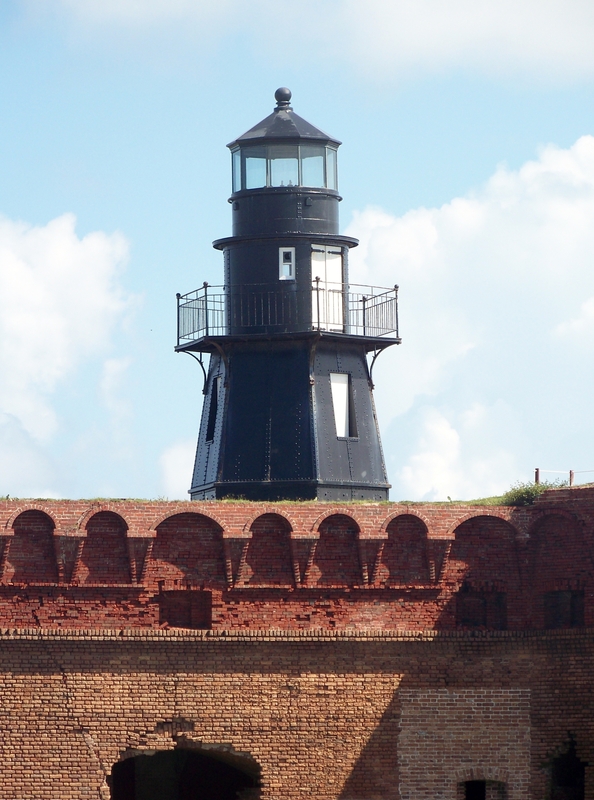 You can learn more about Fort Jefferson and the Dry Tortugas at the National Park Service site, http://www.nps.gov/drto/index.htm. 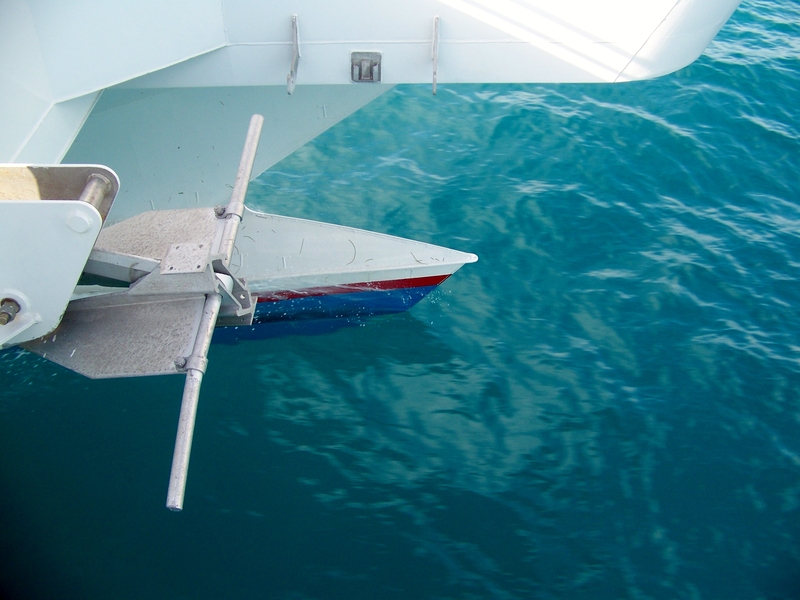 You can learn more about the ferry to the Dry Tortugas at http://www.drytortugas.com/?gclid=CJqAxl-1678CFSxk7AodMncAiA. Campers set up at Fort Jefferson. You can see Loggerhead Key and its lighthouse in the background. Whether or not we want to accept, or even believe it, climate change, whatever the reason, is occurring. And in the face of this change, all of us will need to adapt in one way or another. The National Park Service is also responding to the reality of climate change and trying to make plans that will deal with its effects, preserving our parks as best they can. Fort Jefferson sits on a small key, a small island, and has always been vulnerable to the storms and tides of the Atlantic Ocean and the Gulf of Mexico. Understanding that makes it easy to see why the prospect of a sea level rise of anywhere from .06 to 1.2 meters at Dry Tortugas over the next one hundred years poses great challenges for the agency charged with its maintenance and preservation. 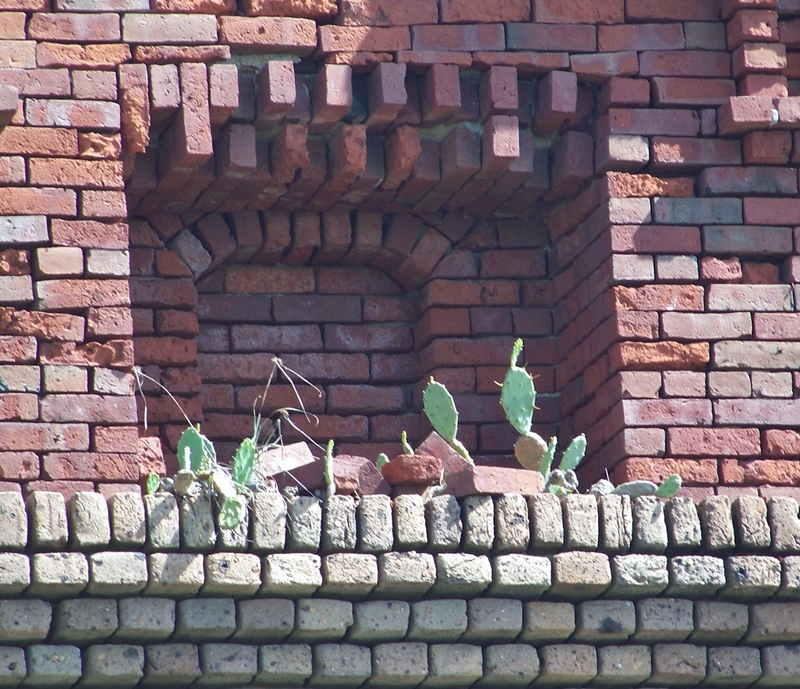 You can clearly see how the walls of Fort Jefferson are deteriorating. The National Park Service reported in 2010 that parts of the structure have already fallen into this moat which surrounds the fort. There are many issues to be considered as the Park Service makes its decisions. Courses of action that might be taken to save the fort, such as dredging, may very well cause extensive damage to the environment. As we all learn to cope with changes in our world, in our environment, in our special and our sacred places. let us all hope we get this right. It is going to be a big job and we need to be up to the challenge. You can read the report on climate change at the Dry Tortugas from the National Park Service at http://ncptt.nps.gov/blog/climate-change-at-dry-tortugas/. As we were traveling through the Florida Keys to Key West where we boarded the ferry to Dry Tortugas National Park, I picked up a cookbook at one of the tourist stops we made (but that is for another posting). Keys Cuisine was written by Linda Gassenheime and was published in 1991 by Atlantic Monthly Press. The book is full of great recipes from the Keys, highlighting its special foods as well as its ethnic diversity. This recipe for Picadillo is slightly adapted from a recipe in Key Cuisine. Picadillo is said to be the original sloppy joe. 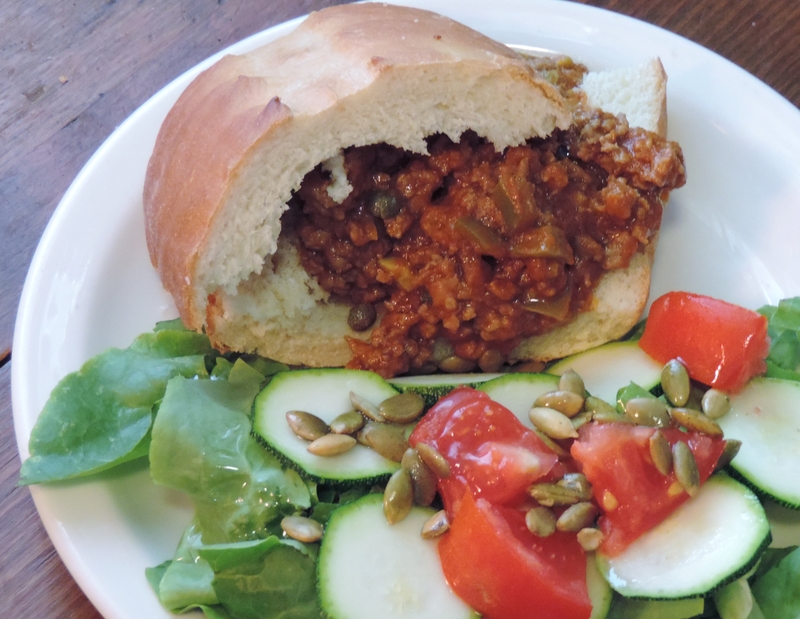 My husband and I think it is much better than any sloppy joe we have ever had. I make my own Cubano bread and you can find the recipe I use at http://www.icuban.com/food/pan_cubano2.html. I hollow out big slices of the Cubano bread and fill them with the Picadillo. Together with a green salad and a class of white wine, this makes a really good supper. Enjoy! A little while back, CNN created a list of 50 Natural Wonders in 50 States (http://www.cnn.com/interactive/2014/07/travel/50-states-natural-wonders/). 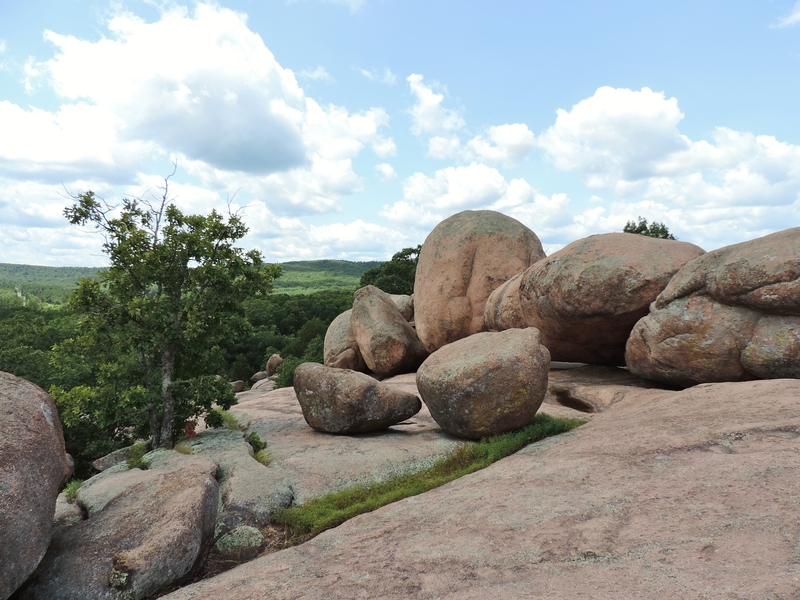 The natural wonder in our state of Missouri is Elephant Rocks State Park. It has been many years since we took our older children to Elephant Rocks, so we decided to pack a picnic lunch and head out to revisit this park we only vaguely remembered. I baked a batch of corn flake crusted chicken and we were off. Such memories…this was the chicken we took on all our family picnics when the kids were home, and it was fun to realize, once again, how good it really is (the recipe is always on the back of the Corn Flake Crumbs box). These are the rocks that give Elephant Rocks State Park its name. 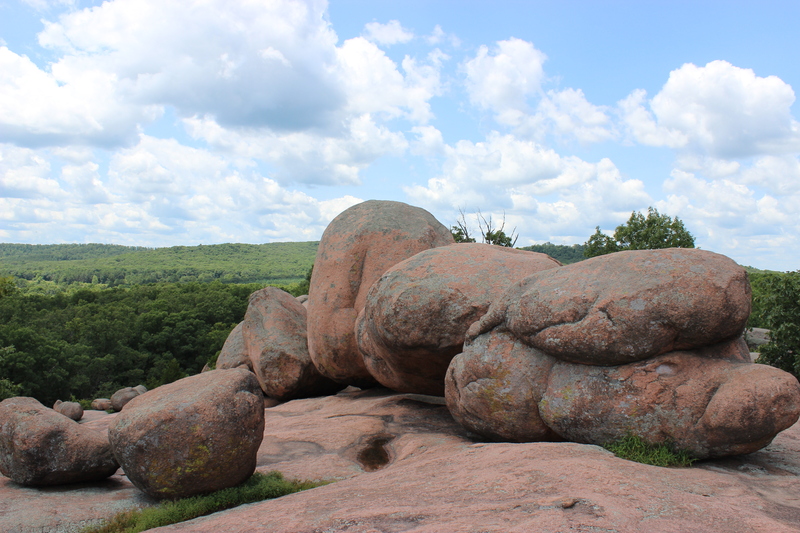 The huge pink boulders at Elephant Rocks are red granite. The granite was formed when hot magma cooled over a billion years ago, then gradually weathered into the huge, rounded boulders we see today. 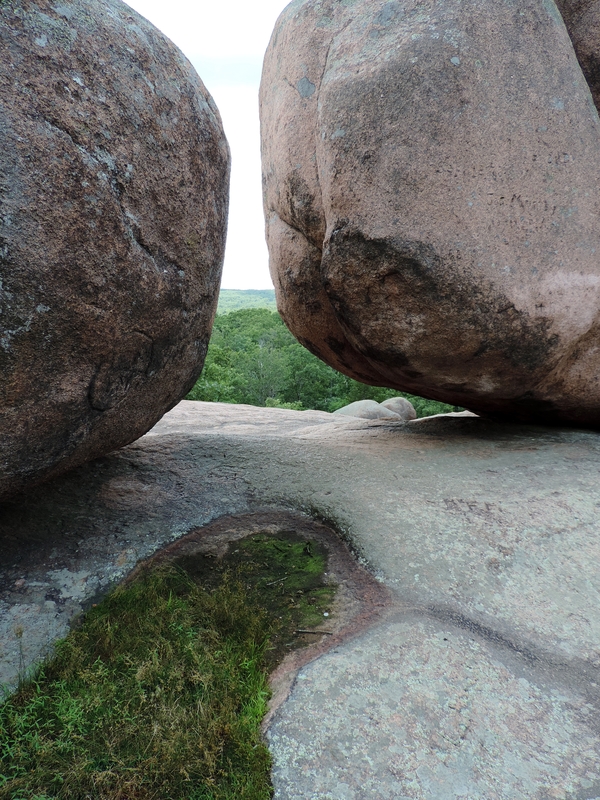 Over time the boulders will erode away, while at the same time, other rock is weathered, making new “elephant rocks”. 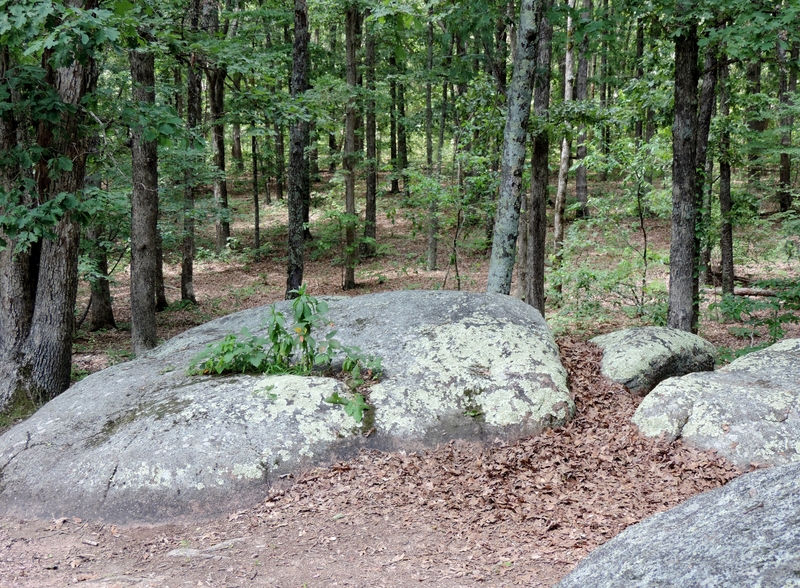 The huge boulders are strewn throughout the park which also includes an old quarry. The granite rocks were quarried during the 1800’s, becoming paving blocks for the St. Louis levee and its downtown streets, facing stones on the Eads Bridge in St. Louis, and the material from which the turned columns on the front porch of Missouri’s Governor’s mansion in Jefferson City were made. In nearby Graniteville, you can see an old schoolhouse and several homes that were built using the highest quality granite blocks from the quarry. Trees and rocks live together in harmony in the park as seen here. 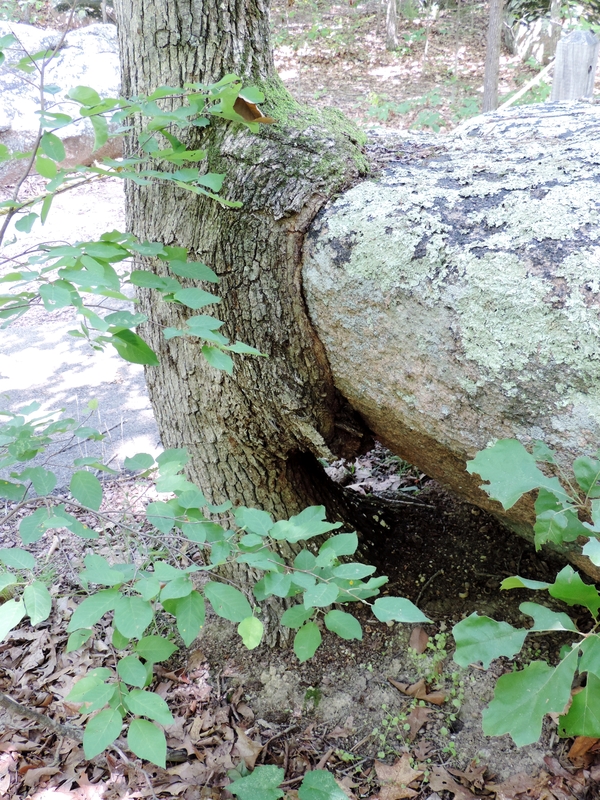 This tree has made its way around the boulder while appearing to hold onto it for some support. A long line of granite rocks along the path. 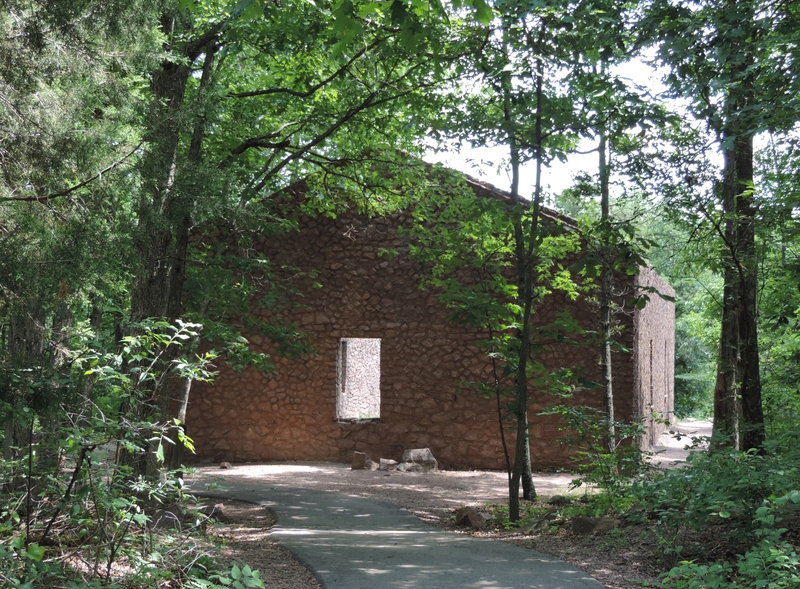 One of the side paths takes you to this ruin of an engine house from the 1890’s. It serviced the trains of the Sheahan Quarries private railroad. The end of the line? 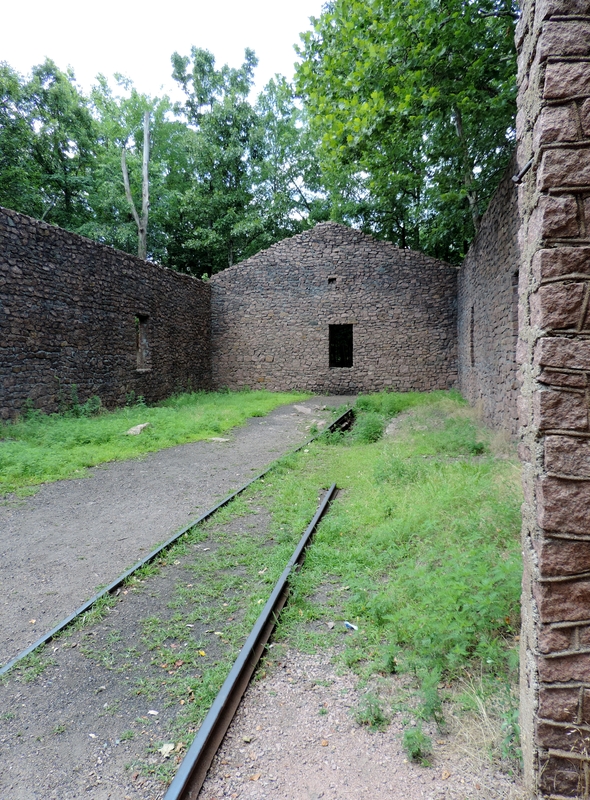 A view inside the old engine house. When you reach the line of “elephants”, you are at a point that provides great views of the surrounding countryside. These rocks are ginormous. The largest rock at the park is 27 feet tall, 35 feet long and 17 feet wide. Dumbo, as it has been named, weighs 680 tons! 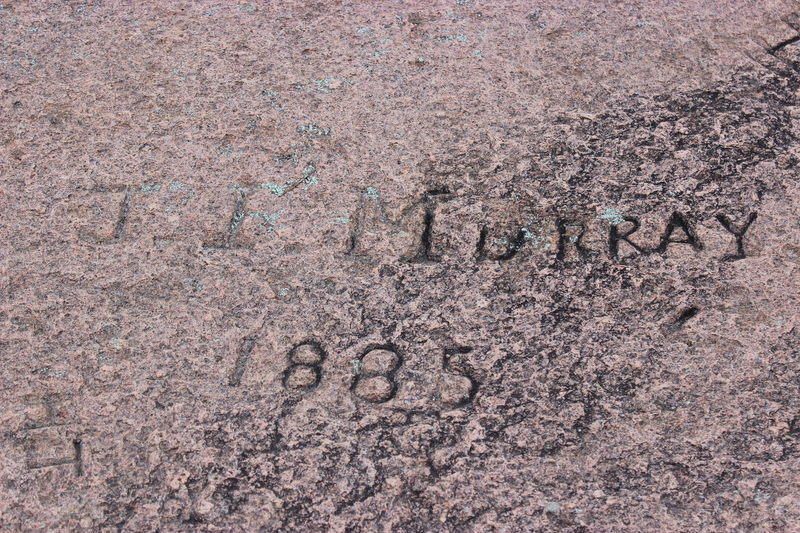 Men who worked at the quarry carved their names into the huge elephant rocks. A view of the old quarry. The water is forty feet deep. 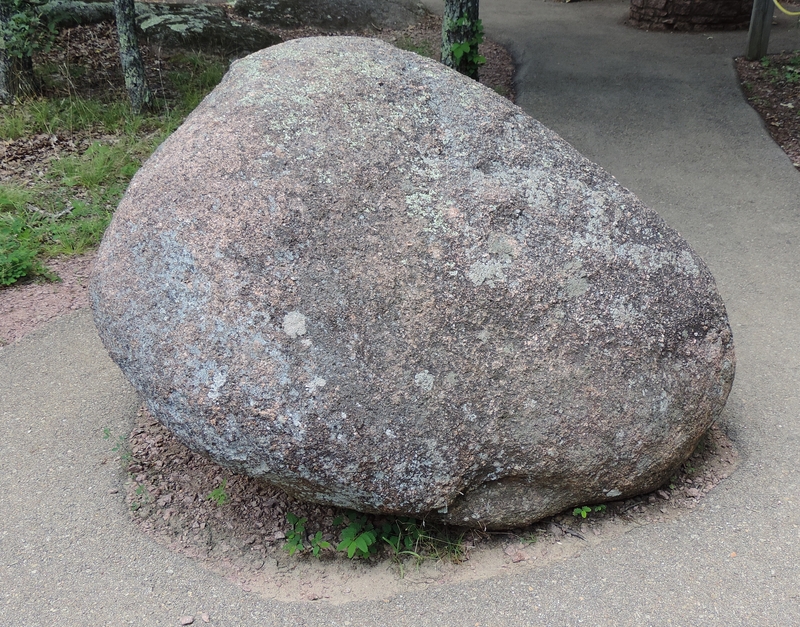 Can you guess how much this granite boulder weighs? It weighs 8,500 pounds, as much as a full-sized pickup truck. At the end of the day, Elephant Rocks State Park is a great walk in the woods! 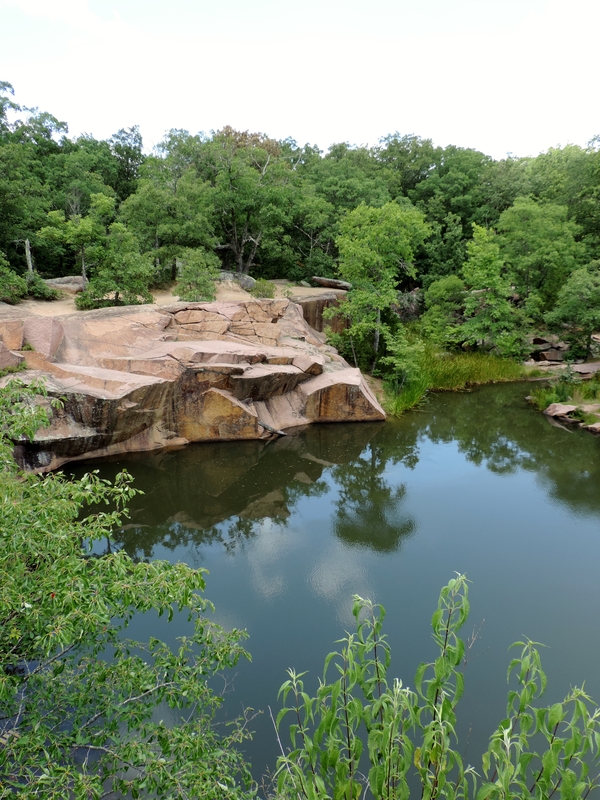 Elephant Rocks State Park is located in Graniteville, Mo, about 90 miles south of St. Louis. 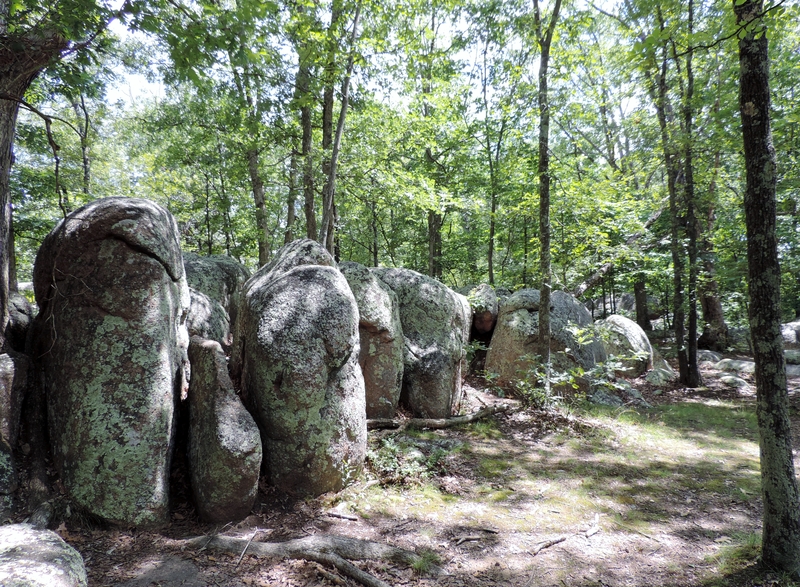 You can learn more about this “natural wonder” at http://www.mostateparks.com/park/elephant-rocks-state-park. After leaving the park, we decided to look for a coffee drink. We found an antique, candy, coffee, etc. shop in Caledonia. 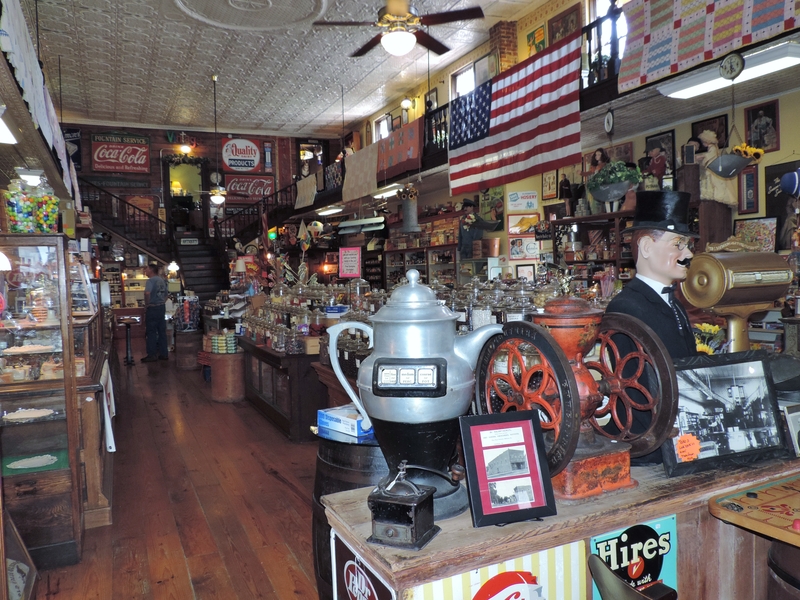 It is called the Old Village Mercantile. What fun…we got great frozen coffee drinks, which remember was all we were looking for, plus 7 oz. bottles of coke (the only way it is really good), fudge, ground coffee, and those little sugar dots on paper I remember from my childhood. What a neat little shop in a tiny little town in rural Missouri. What a great day we had…a day trip not so very far from home! We loved this little antique and coffee shop in Caledonia. Gooey Butter Cake was first made by a St. Louis baker in the 1930’s. It was actually a mistake in recipe ingredients that created this cake, but because America was in the midst of the Depression, the thrifty baker decided to sell the “mistake” anyway. It was a success and Missourians still eat lots of Gooey Butter Cake! There are two ways to make this cake. One way is to use a yellow cake mix and cream cheese. This method is quick and easy, but not the “real thing”. The real cake is made with yeast and lots of butter. It takes time, but it is so worth the extra effort! 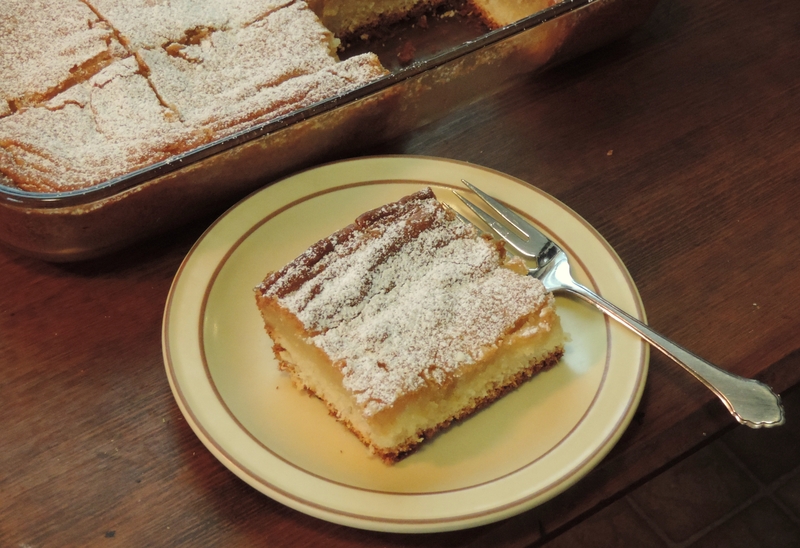 This slightly adapted recipe for Gooey Butter Cake is from Melissa Clark and appeared in the New York Times in November of 2009. Mix the milk with 2 tablespoons of warm water(about 110 degrees) in a small bowl. Add the yeast and whisk until it dissolves. You should see a bit of foam on the mixture. Cream the butter, sugar and salt in a stand mixer. Scrape the sides of the bowl and beat in the egg. Add the flour and the milk mixture alternately, scraping down the sides of the bowl each time. Continue to beat the dough on medium speed for 7 to 10 minutes, until the mixture is smooth and pulls away from the side of the bowl. It will form a beautiful, soft dough that you will press into an ungreased 9 by 13 glass baking dish. Cover the dish with a clean towel and let rise in a warm place* until doubled in size, about 2 1/2 to 3 hours. *Here is a good hint for raising yeast dough when the weather cools and your house may not have any really warm place. Put the dish with the dough into the oven. Turn the oven to preheat at 400 degrees for exactly 1 minute. Turn the oven off and allow the dough to rise…works great every time! Just don’t forget to turn the oven off! Mix the corn syrup with 2 tablespoons of water and the vanilla in a small bowl. Cream the butter, sugar and salt for 5 to 7 minutes until it is light and fluffy. Scrape down the sides of the bowl and beat in the egg. Add the flour and corn syrup mixture alternately, scraping down the bowl after each addition. Spoon the topping in large spoonfuls over the raised dough. Use a spatula to spread the topping over the cake in an even layer. Bake for 35 to 40 minutes at 350 degrees. Be very careful not to over-bake the cake, keeping a close eye on it the last five minutes of baking. The cake, when finished, should be golden brown with an almost liquid center. After the cake has cooled completely, sprinkle the top with confectioner’s sugar. Enjoy! In my previous post, I introduced the Cane River National Heritage Area in Louisiana. We began our visit of the area in Natchitoches, a charming small town in northwestern Louisiana. 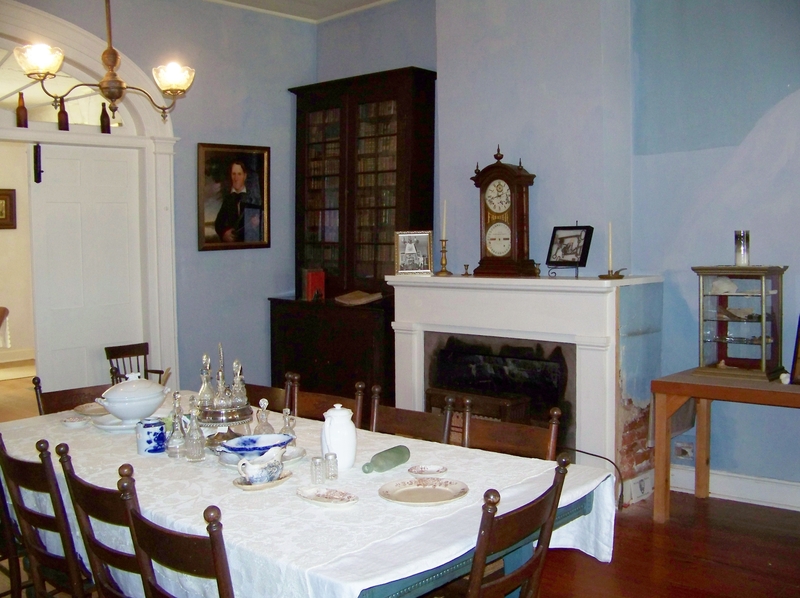 After spending the night in one of the city’s several Bed and Breakfasts, we headed out on Louisiana Hwy 494 to see one of the area’s main attractions, Oakland Plantation, part of the Cane River Creole National Historical Park. This wine bottle garden, circa 1835, edges the flower gardens in the front of the main house. In 1789, Jean Pierre Emmanuel Prudhomme obtained a grant for land from the Spanish government. On this land he built the plantation, originally named Bermuda. 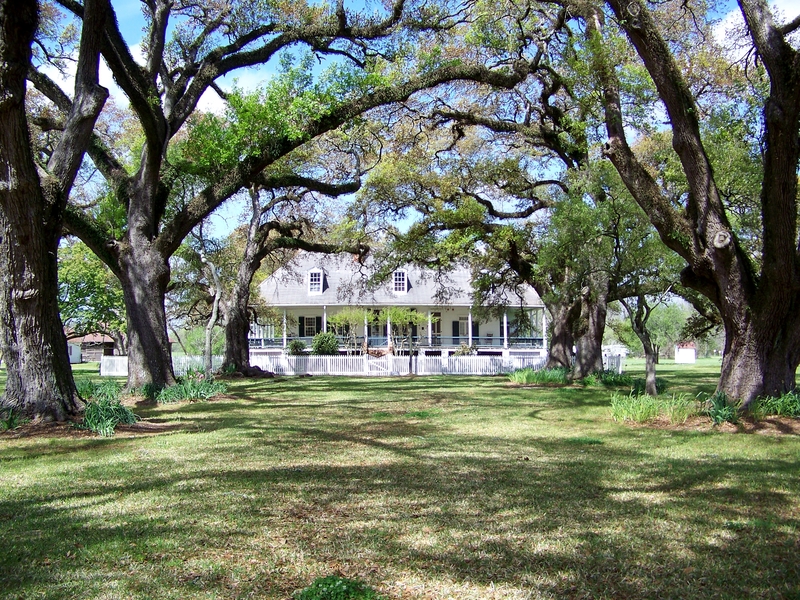 The plantation remained in the hands of the Prudhomme family until 1997, when the family sold the property to the National Park Foundation. 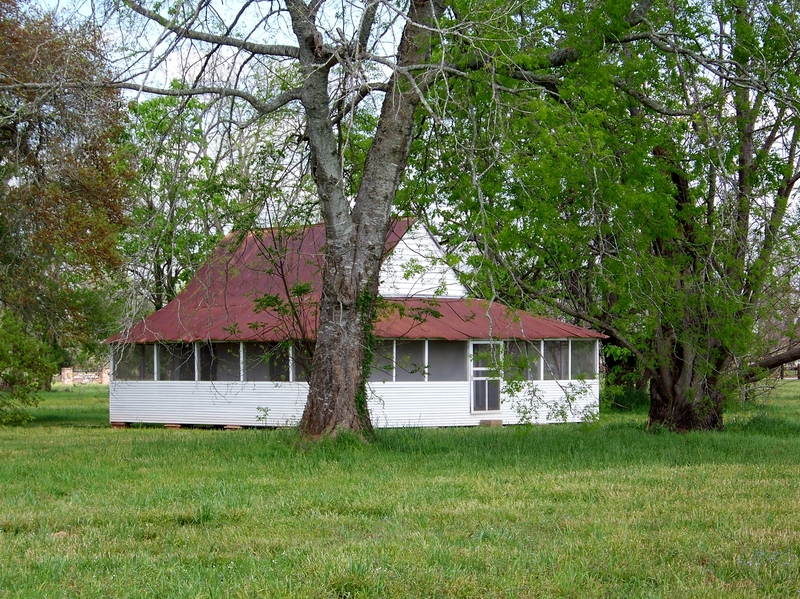 The Park Service has restored the main house to what it would have looked like in the 1960’s. 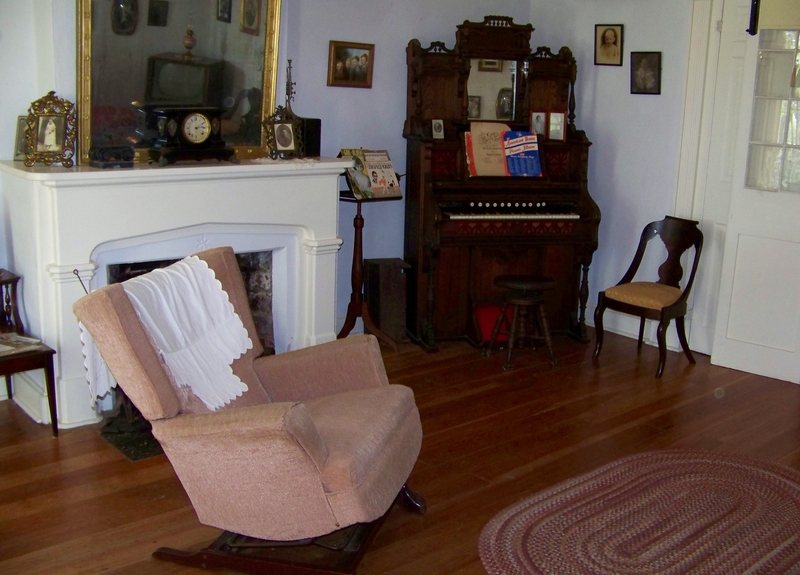 A comfortable spot for reading, playing music,or relaxing in the main house. 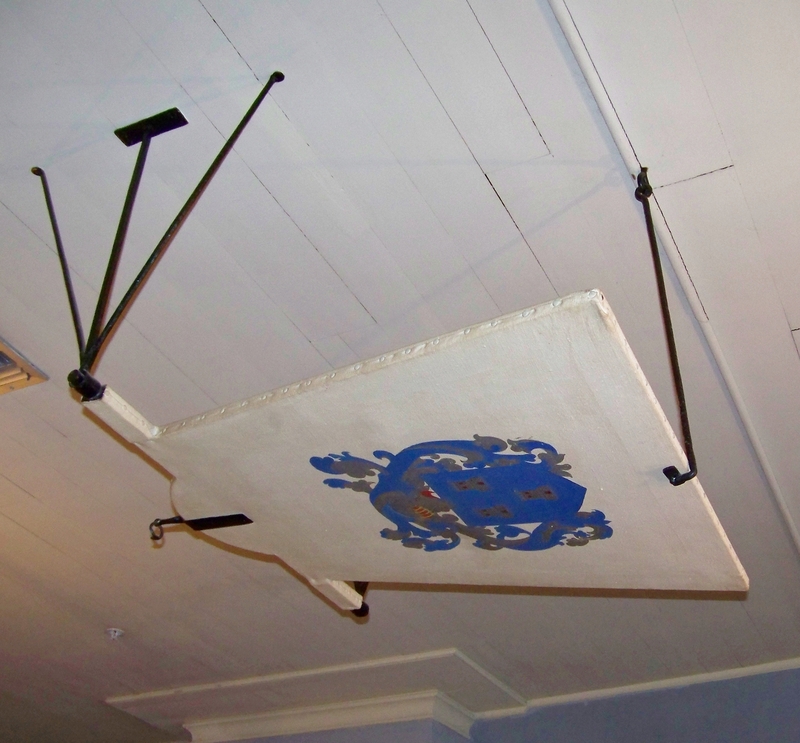 This fan, over the dining room table, would be operated by a slave. It was often called a “shoo-fly” fan. 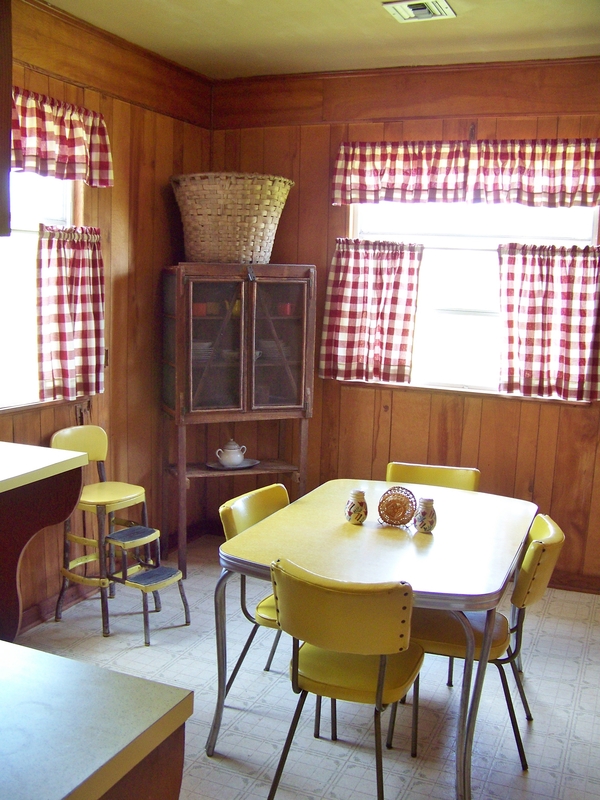 The kitchen at Oakland which appears as it would have in the 1960’s. The master bedroom at Oakland has a cradle attached to the side of the bed. 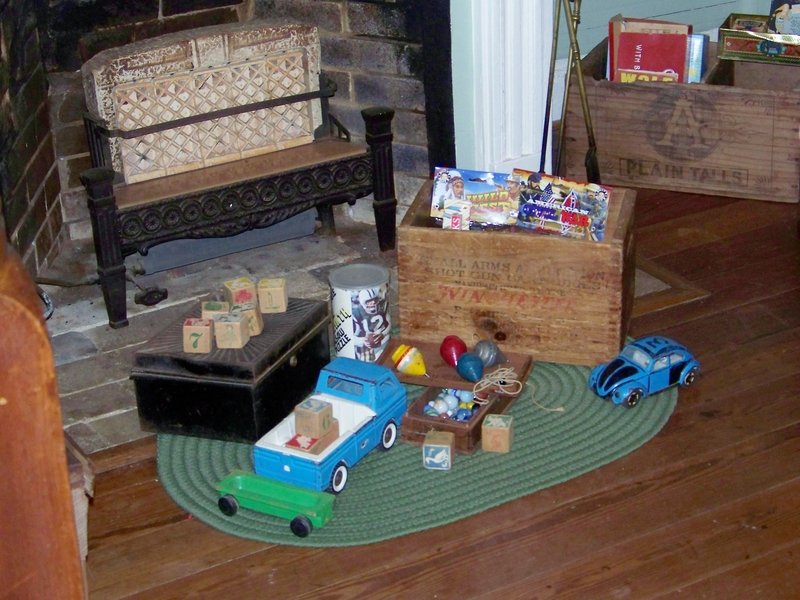 Toys that young boys of the house would have played with in the 60’s. 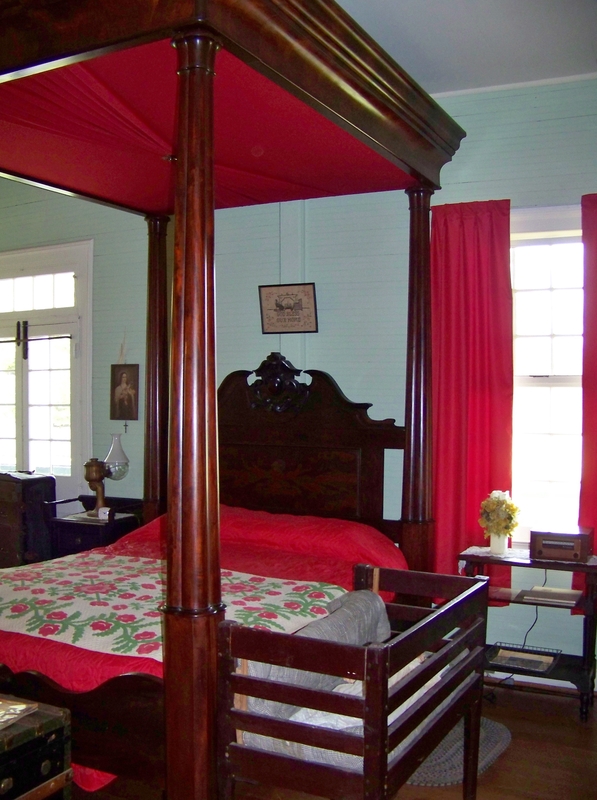 In addition to the main house, there are 27 buildings which are original to the plantation. A National Park Service guide took us on a tour of the property and many of the outbuildings. This is not one of America’s most popular national historic sites, so we had the guide all to ourselves. She spent a lot of time with us, patiently answering all our questions, and helping us better understand what life had been like at Oakland for all the people who lived and worked there. It was truly a community unto itself. In addition to cash crops, the plantation had to provide food for all its people by growing crops and raising livestock. 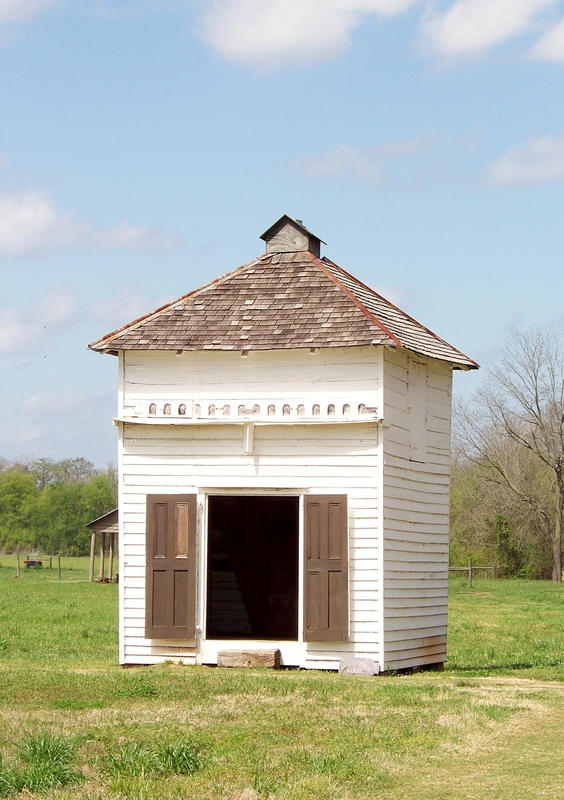 A pigeonnier was a special building used for raising pigeons. Pigeon eggs were gathered for eating and the pigeons were also eaten. 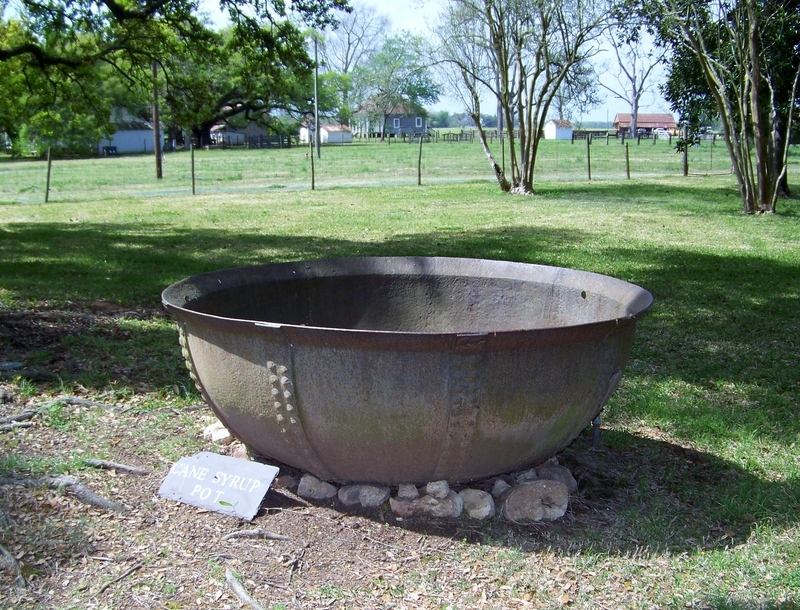 A cane syrup boiling pot, like this one at Oakland Plantation, could be found on every farm and plantation in the old South. They were used to make thick cane sugar syrup and cane sugar brown sugar squares. 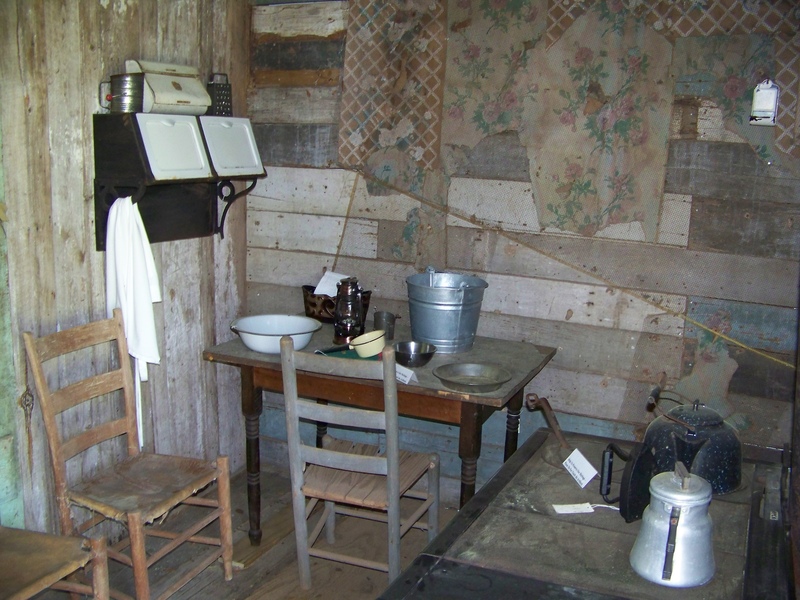 The corn crib was used to dry and store corn that was left on the cob. In front of the crib you can see a scarecrow. 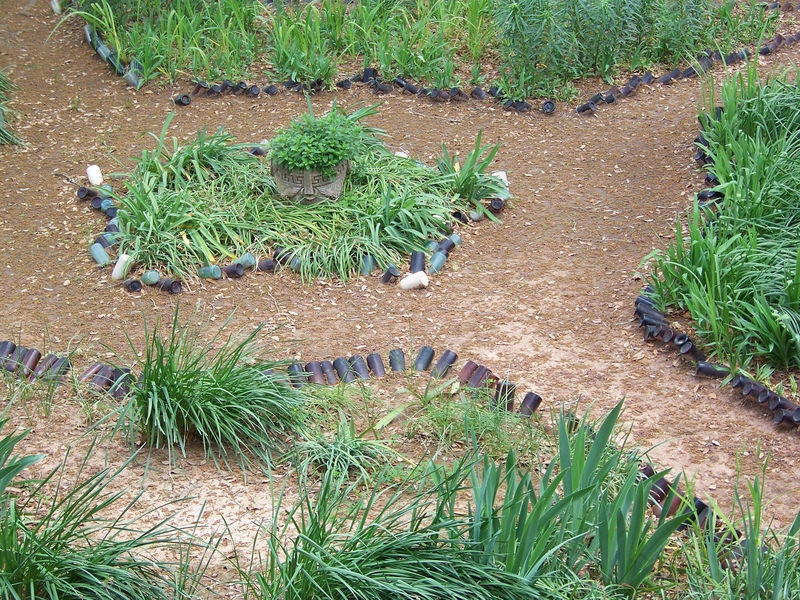 On a typical plantation, slaves were allowed to have their own small gardens for growing food for the slave community. 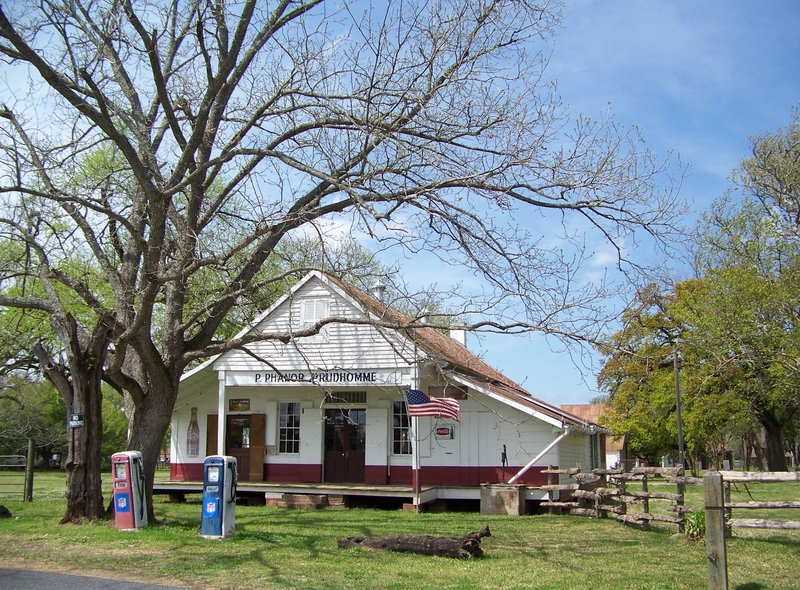 The plantation store was built following the Civil War. It served plantation residents as a retail outlet, a bank, a source for credit, and a place to gather to discuss current events. It also served as a U.S. Post Office. 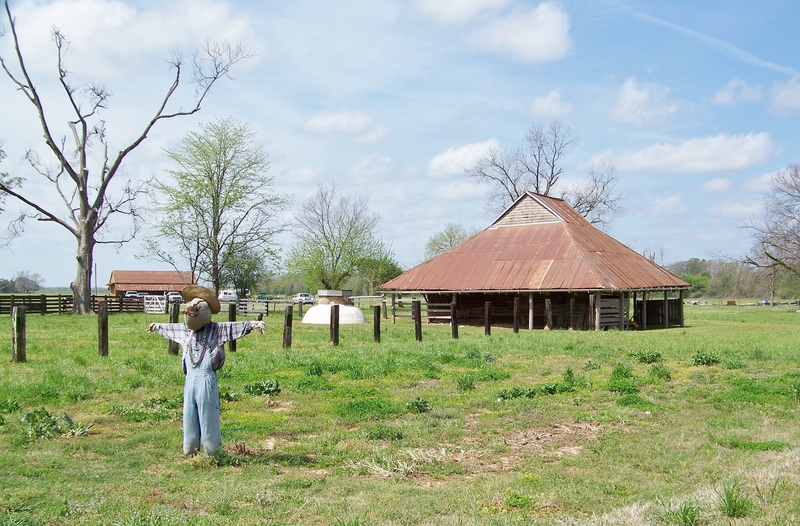 Following the Civil War, those who had once been slaves on the plantation became sharecroppers. These sharecroppers and their descendants were part of the plantation’s history for many years, deep into the twentieth century. The Merriam-Webster Dictionary defines a sharecropper as “a farmer, especially in the southern United States, who raises crops for the owner of a piece of land and is paid a portion of the money from the sale of the crops”. This payment could, in part, be in the form of credit to obtain the things the sharecropper and his family would need, such as food, housing, and seeds for planting. 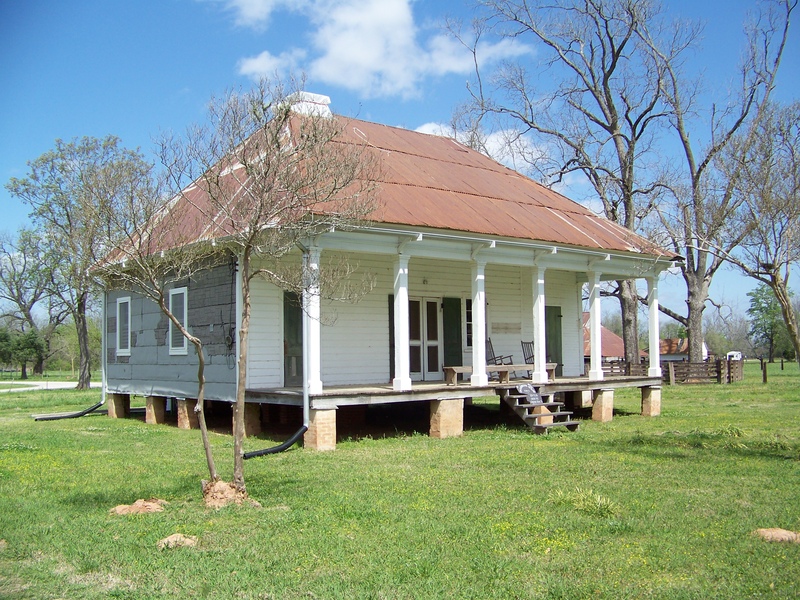 Many of the buildings used by the sharecroppers at Oakland Plantation still remain. They are furnished much as they were when they were being used. 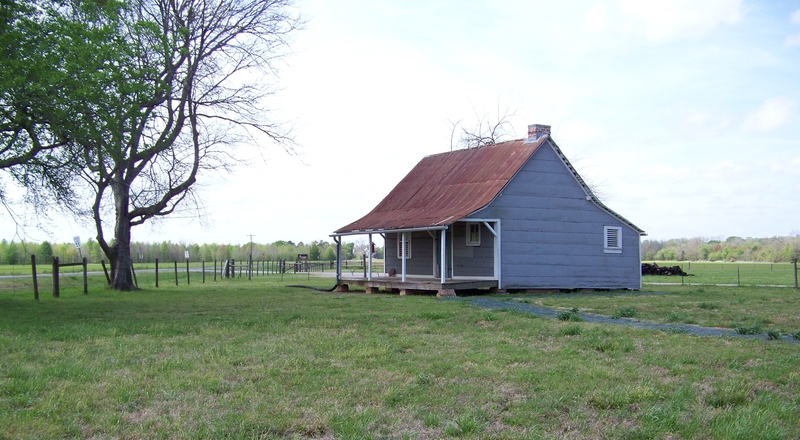 There are artifacts from the lives of the sharecroppers’ families inside these dwellings, such as toys, photos of school graduations and weddings, periodicals, and craft items made by members of the families. 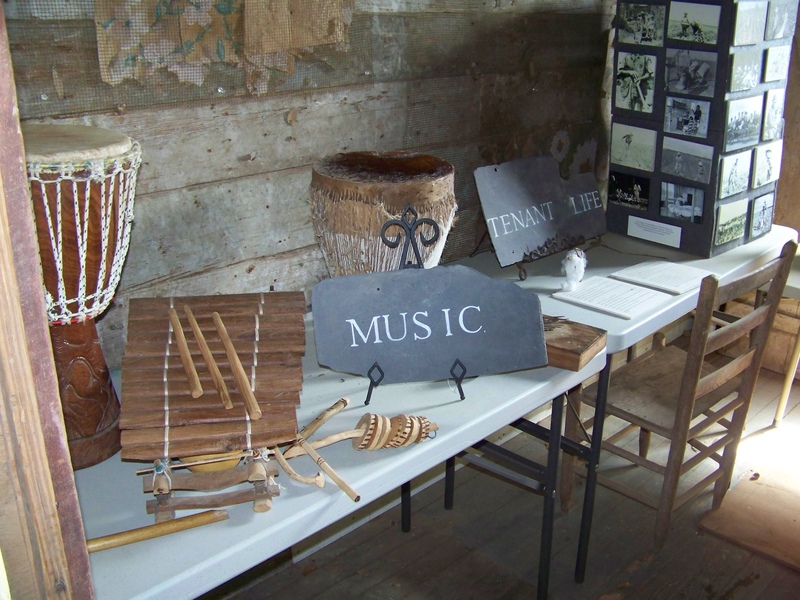 Music was an important part of sharecropper life, just as it had been for the slaves. There is so much more information I could give about this amazing historical site. I think it better, however, if you head out on your own onto the back roads of this nation, discovering its rich history, its exciting stories, sometimes heroic, sometimes tragic, and the lessons we can learn to make it a greater nation with even greater stories to tell. Enjoy the journey! In my last post, I discussed the difference between the Creole and Cajun cultures. Creole cuisine is also different from what we know as Cajun cuisine. There are two main areas in which Creole and Cajun foods differ. The first is that Creole food uses tomatoes, whereas Cajun food typically does not. Another difference is that when making sauces or roux, Creole dishes use butter and Cajun dishes use oil. Creole food is considered “city food”, Cajun is known as “country food”. With that explanation, let’s make an authentic Creole dish! While we were in New Orleans, I bought a small cookbook, The Little New Orleans Cookbook, by Gwen McKee, with illustrations by Joseph A. Arrigo. It contains recipes for fifty-seven Creole dishes. The book was published by Quail Ridge Press and is available for less than $10.00 from Amazon. The inspiration for my Shrimp Creole came from this little book. 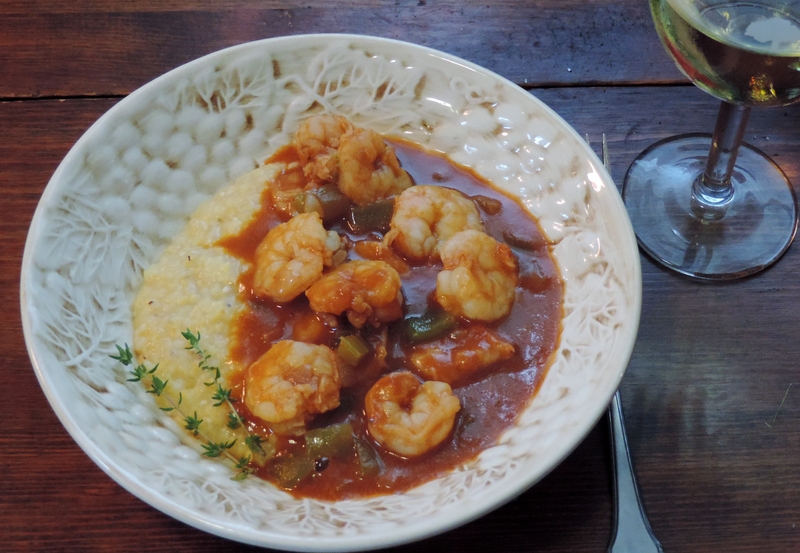 This Shrimp Creole is served over grits. It is equally good served over white or brown rice. In a cast iron pan, or a pan with a heavy bottom, melt the butter on medium-high heat. Gradually add the flour, whisking constantly for five minutes. Turn heat down to medium and continue cooking and whisking for ten more minutes. The mixture should be the color of peanut butter. Add the green pepper, onion, celery, and garlic. Continue stirring the roux mixture for another five minutes, until the vegetables are softened. The roux may become even darker in color, that is okay. Bring to a boil, then simmer for fifteen minutes. Add 1 1/2 pounds fresh or frozen shrimp, peeled, deveined, and tails removed. Simmer ten minutes or until shrimp are done. Turn heat off and allow the creole tosit for at least ten minutes. Serve over hot rice or grits. This recipe will serve four. * Enjoy! *The sauce in this recipe is so good, and we have over a cup left after finishing all the shrimp. I put it in the freezer and use it as a sauce for later side dishes, such as pasta or rice…so yummy the second time around, too!